Albrecht AE497, Identical or very similar to: INTEK Multicom-497, Dragon SS-497, Roadforce 497, Pro Star 497, Comanche Warrior, Eagle Tomahawk and Cherokee CBS 1000. Do these mods and fixes at your own risk! I am not liable for any damage to you or your equipment from following anything listed on my website. Read the disclaimer. When it was first released it had 12 watt output and a list of problems such as mismatched microphone, misaligned sidebands and faulty de-modulator circuit etc. All of these problems are correctable, and in the later radios have been corrected at factory level prior to release. The later radios have 25 watt output as standard and some internal modifications. Hence early models are known as 12 watt and later models are known as 25 watt. However, the 12 watt version can be modified to produce 25 watt output. If you are unsure which version you have, you can do a simple test using a DC volt meter (see Microphone Wiring below). Later (25watt) radio's are now known as 497w where as early (12watt and some 25watt) radio's are 497s. The Albrecht AE497 is a nice enough radio and it has good frequency coverage. After modification it will cover 25.160-29.699Mhz (minor VCO adjustment may be necessary, although I didn't need to re-tune the VCO in my own radio). Anybody who already uses a radio such as President Lincoln or other radio of that standard will probably frown upon this radio, but for anyone just getting into the world of multi-band communication or anyone that just wants a base-station radio could do a lot worse than to look at the Albrecht AE497. Roy from USA (Dragon SS-497) writes: I'm very happy with my new rig. It blows smoke in such a big way that everyone is asking what did I do to my station?? This radio has got to be the loudest radio I've ever owned! I like it better than my Cobra 2000 by far!! I love this radio. I've had radios, but none like this. I like it better than the old Superstar 4900B and even yes, my old Galaxy 2527 believe it or not. It has a lot cleaner receive. Bridge the negative pole of any bulb to ground to bypass the dimmer. After the modification, the radio can be used from 25.160 MHz to 29.699 MHz (454 Channel CB Mode). 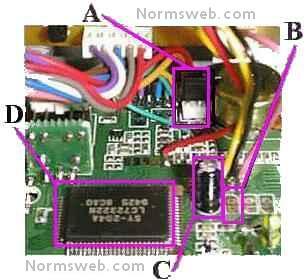 How to Mod: Locate the CPU (D) on the front board, then look for CN1 (A). If CN1 is a jumper as in the pic, then remove it. If CN1 is a diode, snip one leg. When this is done you need to momentarily short SMT 3 (B) to discharge C222 (C) and reset the CPU. How to Switch Modes: Press FUNCTION, then press 2 (CALL) and hold this key pressed for about 3 seconds. Release button and the unit works on 454 Channels CB mode until the radio is switched off. Once you have switched to CB mode, You can toggle between channel number and frequency display by pressing FUNCTION then CALL, but this time only touch the call button momentarily. Pressing 2 (CALL) button without pressing FUNCTION will cycle bands, A B C D E F G H I J. Use this chart to determine how you want your radio to operate (after doing frequency mod). Note: This table is specified for 25 Watt version. I have not checked whether it corresponds with 12 Watt version. Use at your own risk! Roy from USA writes: I did the variable power mod, but, it gets the unit very hot! Especially when I turn it up to get through the hash and trash on the band. Mine is swinging up to 45 watts so, there's a lot of power going through it. I remedied this, by installing a 12 volt box fan that I grabbed out of an old junker computer power supply. I removed the speaker from inside my unit and moved it over to one of the side vents on the top. I then, installed my fan right where the speaker went and it fit perfectly, imagine that! I also added a switch by removing the phone jack in front and installing a Spdt where I now had a new hole. I wired my hot wire to the on off switch to my unit after I checked the voltages of course, and the ground went to a solder point on the chassis by the board. If you find that your radio looses it's memory settings if not used for a few days, give this upgrade a try. The modification is simple, But to get to the solder-joints to do the job you have to strip the front of the radio down, So only attempt it at your own risk. This mod should hold the memory's for about a month. Replace the original (16v 100uf) with 16v 1000uf. Make sure you know which version of the 497 you've got or you'll short out your radio. How to check: Turn radio on. Connect the negative probe of a DC volt-meter to pin 5 of mic socket, then connect the positive probe to pin 2. If you get a reading of around 5 volts then you have got a 25 watt radio, if you get around 0.15 volts you have got a 12 watt radio. Remove RV4, Mount a 4.7K (linear) pot to radio, wire the new pot in the space where RV4 was. Roy from USA writes: I did the variable power mod. For my variable, I removed the mic gain pot in front and got a double pot from an old echo board and wired it and the variable mod to that pot. Now, I didn't have to drill a hole anywhere and it still looked like new with no butchery to it. First, check the microphone and the lead (use a continuity tester between TX & ground in the microphone plug, then key the mike) or plug in another mike, to confirm that it's not the microphone at fault. Then, plug in the microphone and press the TONE CALL button. If the radio transmits while the tone call is pressed, this soloution may help you. First check/replace D731 then Locate Q46 (2SA105) on front PCB and replace. Michael from Lanzarote writes: I made a mod to use an eletret condensor mic on the radio and it does sound better on AM and FM, but the SSB is still rough around the edges For the eletret mod use a 1.5V lithium battery, with series resisor of 2.2K feeding the +side of the mic and a 1uF cap in series with the audio out lead into the radio. I mounted it all in the standard mic. Here are some Albrecht documentation PDF's, including a schematic all in one handy RAR file. To decompress, just use winrar or winzip or whatever and enjoy!